Rasik Products Private Limited provides a wide range of embossing bases. We have manufactured our holographic materials and holographic sticker, hologram base materials by using the latest coating technologies which are available in a wide variety of colours and metallization finishes like aluminum and High reflective index (HRI) materials. Our embossing bases are manufactured in a very clean environment and packed very sophisticatedly to meet the quality standards of our domestic and overseas customers. We can also modify the structure of our embossing bases as per customer requirements and their technical parameters. 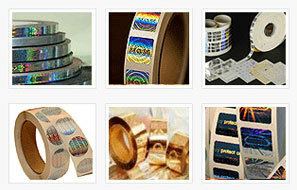 These foils are used by worldwide hologram companies with satisfied results and quality assurance. We also supply adhesives with our holographic materials and hologram base materials which can be used in combination with the specific hologram base foil to give complete solutions for making hot stamping holograms for different applications. Our adhesives are also available for different types of hot stamping hologram bases which means, different grades of adhesives for different hot stamping applications.